Make sure your resume is as rock-solid as the security strategies you design and implement. This sample resume will show you how. If you're looking for the top information security specialist jobs, you must make sure your resume is as rock-solid as the security strategies you design and implement. 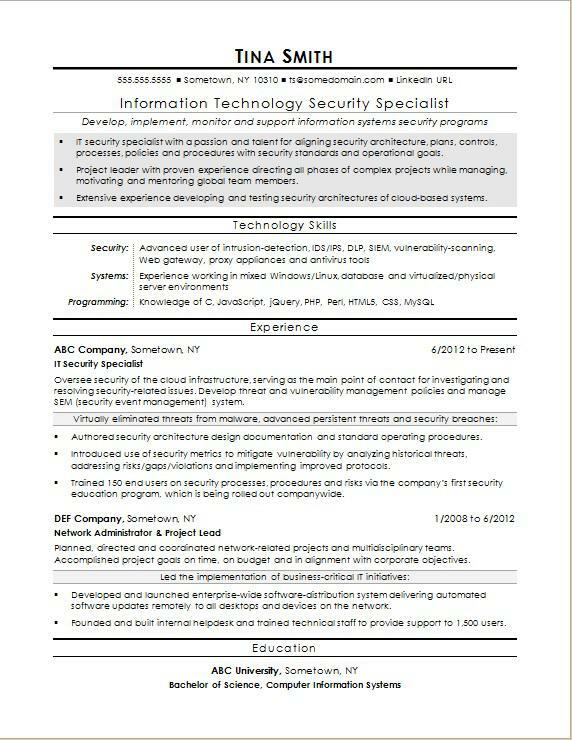 To learn how, view the sample resume for an information security specialist below, and download the information security specialist resume template in Word. Jobs for information security specialists are projected to grow by 28% (or 28,500 jobs) from 2016 through 2026, which is much faster than average, according to the Bureau of Labor Statistics (BLS). You'll find the highest level of employment for this job in the following states: Virginia, California, Texas, New York, and Florida; and in the following metropolitan areas: Washington D.C., New York City, Minneapolis, Chicago, and Dallas. As an information security specialist, you can expect to earn a median wage of $95,510 per year, or $45.92 per hour, according to the BLS. Additionally, you can learn more about security careers and IT careers on Monster. IT security specialist with a passion and talent for aligning security architecture, plans, controls, processes, policies and procedures with security standards and operational goals. Project leader with proven experience directing all phases of complex projects while managing, motivating and mentoring global team members. Extensive experience developing and testing security architectures of cloud-based systems. Oversee security of the cloud infrastructure, serving as the main point of contact for investigating and resolving security-related issues. Develop threat and vulnerability management policies and manage SEM (security event management) system. Authored security architecture design documentation and standard operating procedures. Introduced use of security metrics to mitigate vulnerability by analysing historical threats, addressing risks/gaps/violations and implementing improved protocols. Trained 150 end users on security processes, procedures and risks via the company’s first security education program, which is being rolled out companywide. Planned, directed and coordinated network-related projects and multidisciplinary teams. Accomplished project goals on time, on budget and in alignment with corporate objectives. Developed and launched enterprise-wide software-distribution system delivering automated software updates remotely to all desktops and devices on the network. Founded and built internal helpdesk and trained technical staff to provide support to 1,500 users. A strong job search requires a resume that communicates your skills and experience, as well as the value you'd bring to a company. Not sure your resume is up to code? Get a free resume evaluation today from the experts at Monster's Resume Writing Service. You'll get detailed feedback in two business days, including a review of your resume's appearance and content, and a prediction of a recruiter's first impression. Think of it as security for your job search.